This year's HR Innovation Day is approaching. It is a good tradition to present the keynote speakers and contributors in interviews. My interviewee for today is Tom Haak. Tom is a well known international HR expert and insider. He is a very active supporter of my event and has often provided innovative impulses and international insights. The video of his keynote at HR Innovation Day of last year has been viewed more than 2800 times. Tom was also kind enough to answer my "(5 (+1) Question/s on expectations on Human Resource Management". Peter: Tom, thank you so much for contributing again. Could you be so kind and describe current developments of your HR Trend Institute briefly? Tom: We continue to keep track of development in HR, specifically in HR Tech. I am proud that many organisations, often big multinationals, ask me to inspire their HR team. Inspiration is our main objective. Life in organisations can be a lot better, with more fun and a better use of the potential of people. With others we are working on the HR Tech Community. This is a platform where we want to give a good overview of the HR Tech landscape. Not a catalogue with all the solutions that exist, but a selection of cool and innovative solutions that are good examples. Your community can certainly help us to improve our HR Tech community. Interesting for the German and Europan market: I am partnering with Zukunft Personal Europe (11-13 September), and I will give some guided tours, passing by solutions I find interesting at the exhibition. Last year I did one, this year there will be more. Peter: What will be the main points of your input 2018? Tom: One of the important trends is more focus on the employee experience. HR can learn a lot from marketing, where they are leading the way with customer experience. I will give an overview of the employee journey, and show examples how the different phases of the journey can be supported by HR Tech. I will also talk a bit about workforce analytics, as measurement and analytics are critical to improve the employee experience. It is not one size fits all, as the expectations of people can be very different. Peter: I fully agree. In my view too, Employee Exerience is a very important trend. What other trends do you also see for HR? Tom: The most important long-term trend, in my view, is personalisation. It is related to the employee experience. I have also labelled this trend "From Please the boss to Employee Intimacy”. Do organisations really take the effort, to get to know their employees (and other people who are not necessarily on the payroll). What do people aspire? What are their capabilities, what do they want to learn? Generally, organisations do not take a real effort. Another trend I called “Power to the people”. Employees will want to become more independent of organisations, and they will take their own initiatives. The other day, I came across an interesting example in football. There is a company, Your Tactical Analyst that helps individual players (who pay them) with a thorough analysis of their matches, and giving tips on how to improve their game. The players do this independent of their club, as they feel the club does not focus primarily (and understandable) on their development. These types of services will also appear more and more in the business environment. Power to the people! Peter: I am always surprised on your new ideas surprising the HR community al all. “Ask Tom” is an excellent idea. Tom: As our brand recognition is increasing, more people ask questions. The HR Trend Institute has a large audience in India, and especially Indian students are not shy to ask questions. (“Hey Tom, I am writing a thesis about AI and HR, can you please give me some guidance’). I like to receive these kind of questions, and if I am able to give some guidance, I will do. 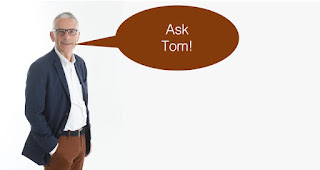 I am collecting some of the questions and my answers in “Ask Tom”. Working with students is always rewarding, and it is important that a new breed of HR professionals is trained. Peter: One main problem for me is that most of HR managers are very difficult to convince of new ideas. Do you have any ideas or tips on how to change this attitude? Tom: Maybe we should try not to make the HR professionals the bottleneck in the digital transformation. It is comparable with the organisations that keep saying that all their managers should be good people managers and coaches. The reality is, that many managers will never be a good coach. Maybe it is better to let people do what they love and what they are good at. May coaching people on their professional and personal development should be left to people who are good at this. We can push and push, and say that HR professionals should embrace digital, innovations and workforce analytics. It might be more effective to look for other people as ambassadors. Managers who really want to make a difference. Employees who are looking for solutions that help them. In the meantime you can train HR professionals who are digital natives. Peter: What can the listeners expect from your Keynote in general? Tom: Hopefully a positive AE (Audience Experience). I am looking for ways to make my keynotes more interactive, so the audience can expect some experiments. They can also expect some fun, and practical examples they can use immediately. Peter: Finally, a question I'd like to ask all the speakers. Why are you participating at the HR Innovation Day 2018? Tom: This will be the third time I participate, as as I am coming back, you can certainly assume I like it. The atmosphere is excellent (informal and participative), I always meet interesting people with a keen interest in HR tech and innovations and I learn new things from the other speakers. Peter: Thank you very much today for your support of the HR Innovation Day. I look forward to listen to your keynote. In the last years Tom Haak conducted workshops on HR Trends for organizations as Achmea, AstraZeneca, Ampelmann, Booking, Boskalis, Dutch Ministry of Foreign Affairs, Fugro, JonesDay, Oracle, Perfetti van Melle, Procter & Gamble, Robeco, Unilever, JDE, Deutsche Telekom, Heineken, Siemens, Nutreco, Eneco, Airbus, Ferrovial, ABN-AMRO and various others. He is also a regular keynote speaker at prominent HR conferences worldwide. Looking forward to the speech!